What an amazing long weekend! With school starting back up tomorrow, a quick, easy and healthy dinner is the perfect item to add to your weekly meal plan. A one minute prep time is pretty awesome too! Place chicken in the bowl of a slow cooker. Top with salsa, diced green chiles, cumin, onion and garlic. Cover and set on low. Cook for 8 hours. Remove chicken from pot, shred and return to juices. Spoon chicken into taco shells, with whatever toppings your family likes. 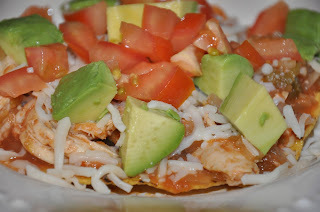 Or use the meat to make burritos, tostadas or as a filling for enchiladas. Love how quick and simple this is! Thanks for sharing.